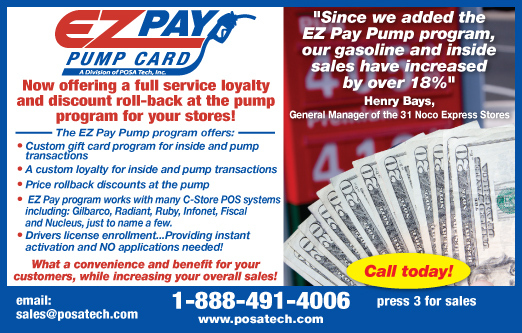 The EZ Pay Pump program offers a custom loyalty program for your POS and outside transactions allowing your customers the ability to earn loyalty points for free merchandise and discounts on select products. The same card can be used as a debit card, giving our retailers a low transaction fee, allowing cash back to your customers on each gallon purchased! Customer fills out an ID application or can swipe their driver’s license using the EZ Pay Pump online registration terminal located in the store. Once the application has been submitted to the EZ Pay Pump database center, the customer is given a magnetic swipe card or they can use their driver's license ongoing when paying at the pump or for inside sales. The same card is used as a loyalty card and each visit is awarded points that can be turned in for merchandise or discounts for purchases. Each retail customer can customize their loyalty program, send email coupons and offer online access to view account activity. The same card can be upgraded to a debit card that charges our retailers a low flat transaction fee, allowing instant cash back savings that can be passed along to your customers for each gallon purchased! Increases store revenues and customer loyalty. Saves thousands in transactions fees and instant savings back to your customers for gasoline purchases!